October is Breast Cancer Awareness Month, and many of our favorite companies partner with charitable organizations to raise awareness and funds for research into its cause, prevention, diagnosis, treatment and cure. 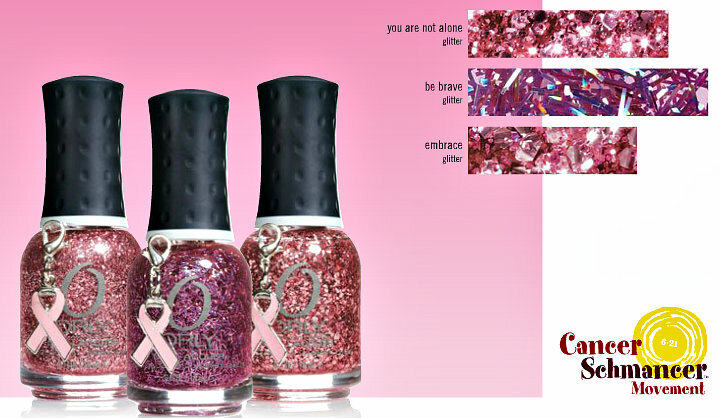 This year, Orly is working with Cancer Schmancer, a movement founded by actress Fran Drescher. 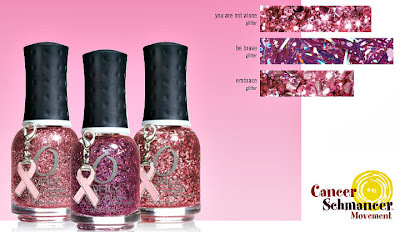 They will be offering 3 pink glitter shades, and each bottle comes with its own pink BCA charm. The color names are You Are Not Alone, Be Brave, and Embrace. Click photo to enlarge detail. Help support early detection. 20% of profits from the Pretty in Pink Collection will be donated to Cancer Schmancer. Cancer Schmancer's mission is to transform women from patients into medical consumers, and to shift the nation's priority from searching for a cancer cure towards prevention and early detection of cancer.